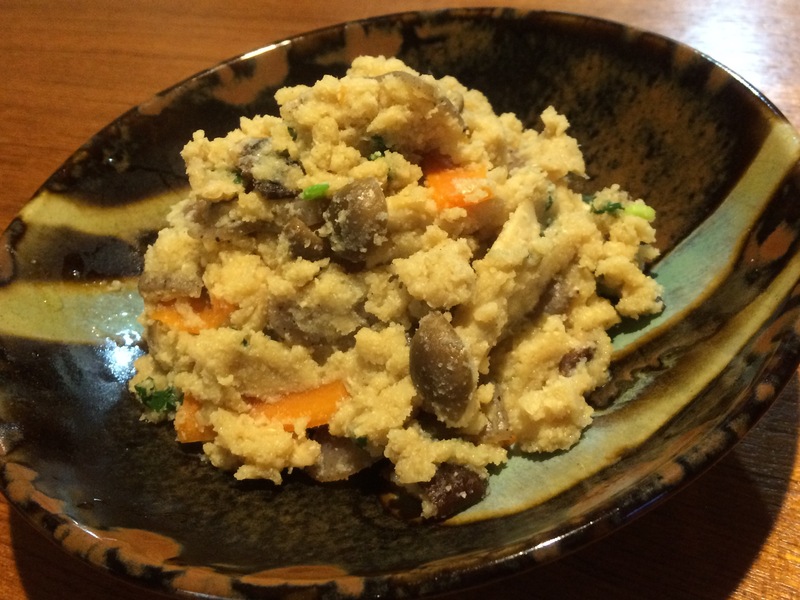 Unohana is the very basic Japanese okara (soybean pulp) recipe. As it’s an edible by-product from tofu, eating okara is good for your health and the earth! In the past, tofu shops give it to the customers for free. It’s no longer free in most shops, but still quite cheap. 1 bag (around 200g) of okara , 1/2 carrot, 4-5 dried shiitake mushrooms, a handful of shimeji mushrooms, 50g konnyaku (devil’s tongue), a small amount of scallion, 3 tbsp soy sauce, 3 tbsp sugar, 1 tbsp mirin. 1. Soak dried shiitake mushrooms in water until soft. 2. Cut carrot and konnyaku in strips. Slice shiitake mushrooms. Discard the base of shimeji mushrooms and separate them. Stir-fry these ingredients in a pan with vegetable oil. 3. Add okara in the pan and stir. Then add 2 cups of the water used to soak shiitake mushrooms and 3 tbsp soy sauce, 3 tbsp sugar and 1 tbsp mirin. Cook until the liquid is gone and it looks like mashed potatoes. 4. Add some scallion, stir and remove the pan from the heat. Can be stored about 2-3 days in the fridge and a couple of months in the freezer.